Hi, welcome and join us as we explore more of Buriram. 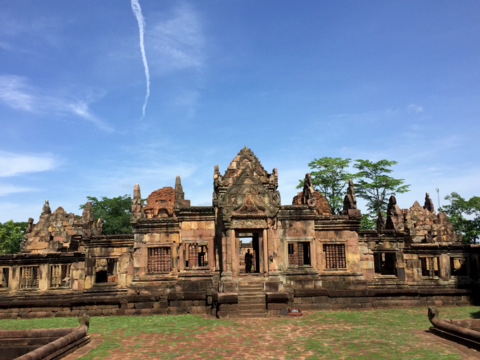 This trip takes us to the 1,000 year old Khmer sanctuary Prasat Muang Tam in Prakorn Chai District in a location that is just 7 km south of the better known Prasat Phanom Rung that’s on an extinct volcano. Prasat Muang Tam is less well known but after viewing the ruins, I realized that is it one of the more complete set of ruins; it displays all the characteristics of the ancient Khmer sanctuaries built with techniques that appear way ahead of their time. Let’s take a walk through this historical site to view the art and architecture a millennium ago. 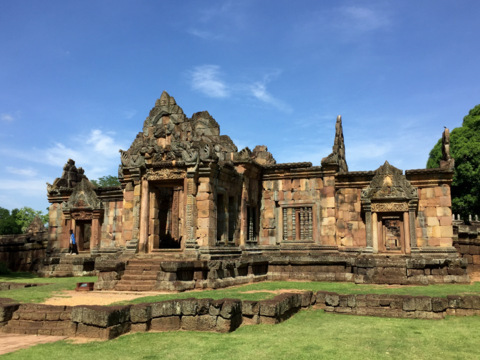 Prasat Muang Tam was built about 1,000 years ago in the Baphuon style of art and architecture during the Angkor or Khmer Empire based in Angkor Wat, Cambodia. It’s a religious sanctuary to honour the Hindu God Shiva and was a place of worship and religious ceremonies for the communities that lived around this shrine. Archaeological evidence uncovered in recent times indicates the presence of communities in this area as far back as 2,500 years ago during the Iron Age. 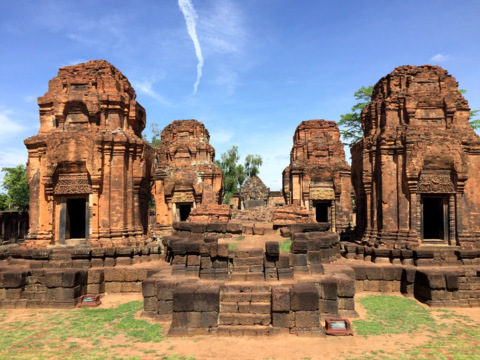 This old sanctuary is located just north of the Dangrek Mountains and Cambodia along what’s known as the Cultural Route where pilgrims from Angkor Wat travel through the mountain passes on their pilgrimage to other sanctuaries located in Buriram, Korat and Surin. About 700 years ago, the sanctuary was abandoned and deteriorated over the centuries. The surrounding communities disappeared as well. It was only in the mid-20th C that the area around the sanctuary was re-inhabited owing to the fertile soil from the volcanic deposits and a reliable supply of water in the area. 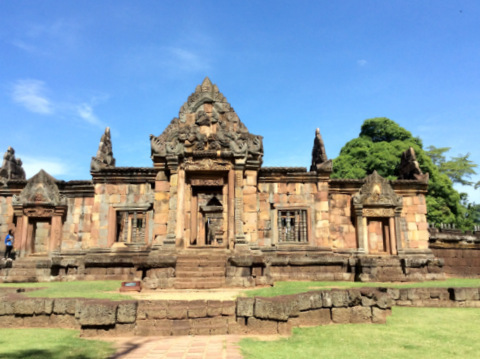 The locals called the sanctuary “Muang Tam” or low city in comparison to Prasat Phanom Rung up in the mountains. This low position had its advantages as we shall see later. 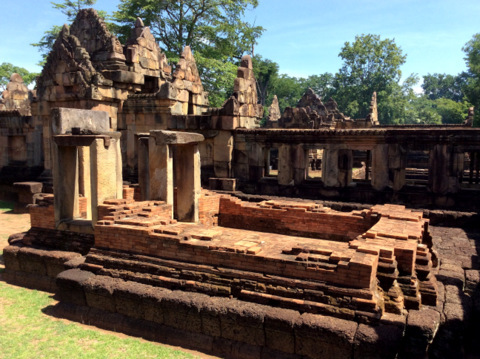 In 1935 Prasat Muang Tam was designated a historical monument by the Fine Arts Department. Excavation only started in the 1960s. From the mid-1980s to the mid-1990s restoration work was done on the ruins. In 1997, Prasat Muang Tam was officially opened by HRH Crown Princess Maha Chakri Sirindhorn to commemorate the Golden Jubilee of HM the King’s reign. 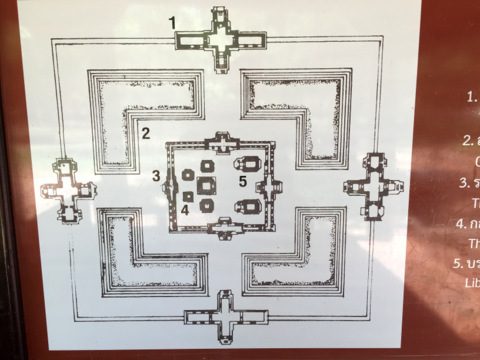 Like all Khmer sanctuaries, Prasat Muang Tam is rectangular with two concentric rings of walls. The outer walls are 120 by 127 m and the structure is made of laterite, sandstone and brick. 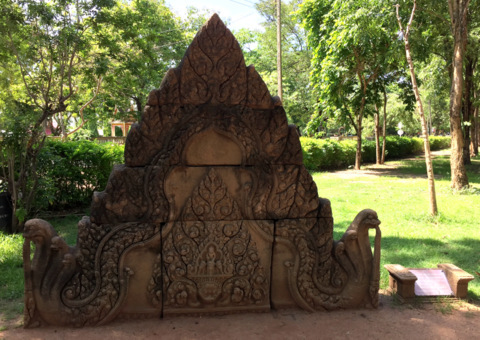 The outer or boundary walls form a rectangle 120 x 127 m, with a height of 2.7 m. These walls are made from rectangular laterite blocks topped with decorative carvings. Archways that serve as doors to the interior are located in the middle of the walls on all four sides. The courtyard between the outer and inner walls has four “L” shaped ponds fitting neatly into the corners of the boundary walls. 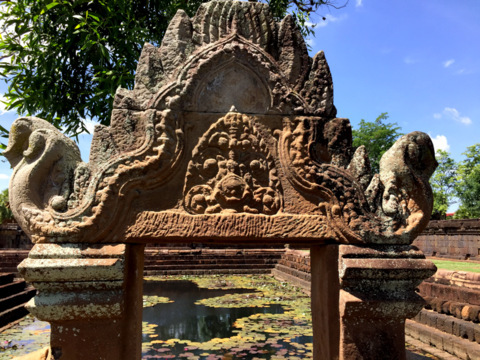 The edges of the ponds are lined with the Naga serpents. Steps lead down to the pond through an elaborate archway. These ponds contain sacred water used for religious ceremonies. The pathways created by these ponds lead to the archways through the inner walls. The inner walls are actually double walls which form a corridor around the group of towers at the centre of the sanctuary; hence it’s referred to as the gallery. There are archways on all four sides leading to the interior. This group of towers forms the inner core of the sanctuary. There’s a main or principal tower in the centre which represents Mount Meru, the centre of the universe, the abode of the gods and it’s surrounded by four minor towers. Unfortunately the main tower has collapsed completely. It was here that archaeologists discovered the Linga, phallic symbol of Shiva’s creative power. Besides the group of towers in the inner core, there are two minor towers which are used to store sacred scriptures. Here again, only the base of the libraries and some pillars are all that’s left. This is a special feature which is not present in many of the other Khmer sanctuaries in Thailand, a huge reservoir or Barai. This reservoir is 1 km x 0.5 km and 3 - 4 m deep. The water here represents the ocean surrounding Mount Meru, the sanctuary home of the Hindu Gods. 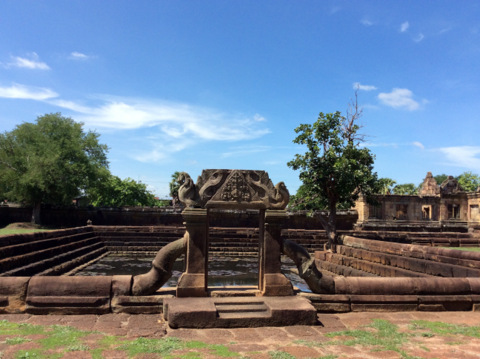 It flows down from Phanom Rung and Prai Bat Mountains through a channel to the west of the reservoir in an area that’s called Saphan Khom or Khmer Bridge. 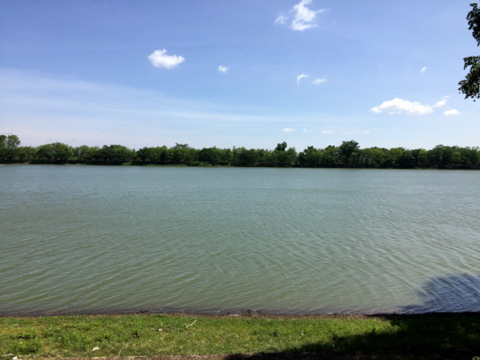 The reservoir serves the consumption and agricultural needs of the surrounding communities and it is for this reason that the people chose to live here. 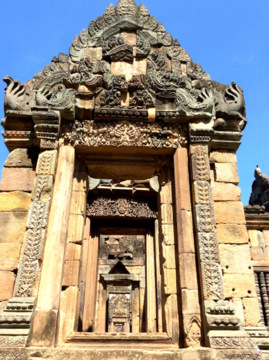 Khmer sanctuaries are renowned for their elaborate sculptures on gables, lintels, doorways and walls. These carvings depict the various Hindu Gods and Goddesses. The first sculpture is just after the main entrance to the historical park. It was originally located at the porch leading to the principal tower. Each corner at the base has a five-headed Naga serpent with its body arching up to the apex of the triangle. 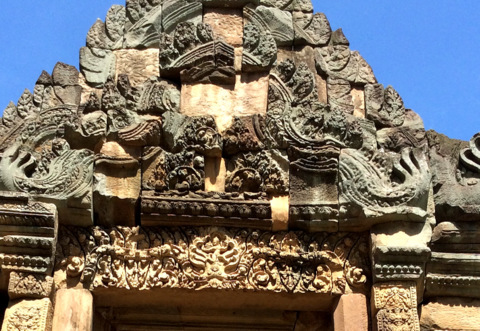 Near the base of the triangle is a carving of Indra astride his steed the three-headed elephant Airavata or Erawan. 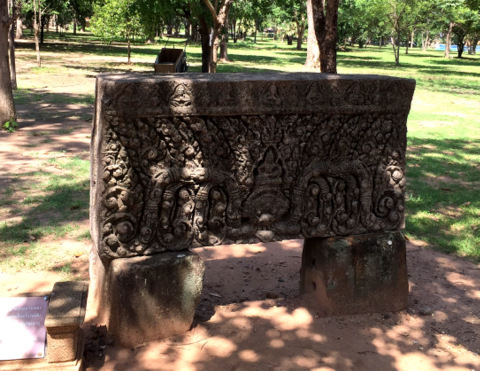 The second lintel is also located in the grounds of the historical park. It was originally in one of the minor towers located to the south. It’s a carving of Indra in the Baphuon art of the 11th C AD. The next lintel which is over the entrance to one of the minor towers depicts Shiva and his wife Uma astride his white bull Nandi. The fourth lintel is above the east entrance of the outer or boundary wall. It depicts Krishna fighting the Naga Kaliya who poisoned the river used by Krishna’s people. 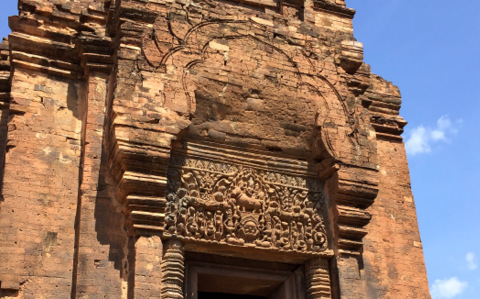 These are some of the special features of the Khmer sanctuaries that are well illustrated in Prasat Muang Tam. Firstly the entrances through the outer wall, inner wall through the centre to the doorways on the other side are in perfect alignment. How this was achieved with the technology of 1,000 years ago is a point to ponder. Secondly it was only on my visit to Buriram that I found out about the quarry that is the source of the stones for these sanctuaries. 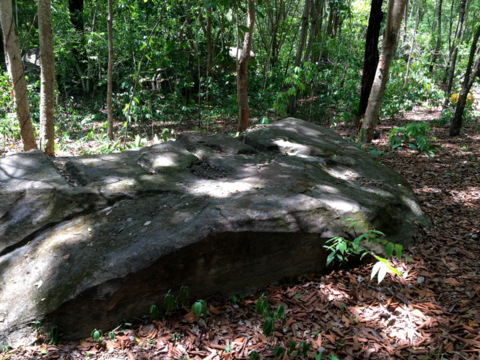 This quarry is located 20 km to the south of Prasat Maung Tam near the Thai-Cambodian border. Imagine hauling all these blocks of stone from the quarry to the construction sites some of which are 100 - 200 km away. 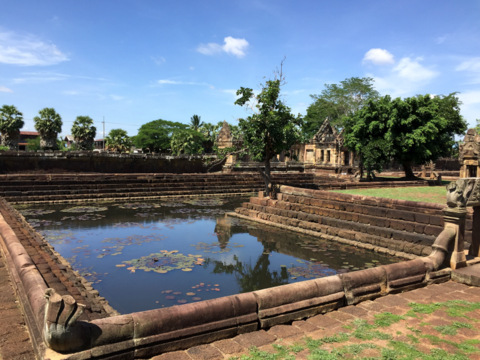 Lastly as far back as 1,000 years, the Khmers had a basic water management system of catchment areas to hold water from the mountains and rain. A network of channels was built to channel the water for agriculture and personal consumption. This may appear insignificant if not for the fact that even in the 21th C; we are still grappling with this problem in many places. From Bangkok - Vibhawadi Rangsit Road - past Don Mueang Airport - Highway 1 – Saraburi – Highway 2 – Highway 24 to Pak Thong Chai – continue on to Nong Rong. From Nang Rong you can continue north along Highway 218 to Buriram or base yourself in Nang Rong which is more convenient as Prasat Phanom Rung and Prasat Muang Tam are near Nang Rong. Avoid using Highway 226 linking Buriram City to Korat as it’s a single lane road for part of the way and travel will be slow. You will also get stuck in the traffic in Korat City. Use Highway 24 which bypasses Korat City and goes to Pak Thong Chai straight on the Nang Rong. It’s a dual carriageway and traffic is light. There’s a Tourist Information Office and Museum near the car park outside the historical park. Drop in here before going to the historical park and the sanctuary because it has a wealth of information.